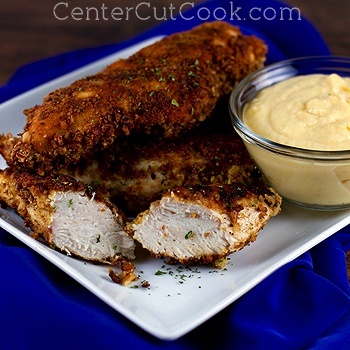 Crispy, crunchy pretzel crusted chicken brings life back to Chicken Night! I cook with A LOT of chicken these days. It’s lean, it’s healthy, and it’s so versatile. Despite the fact that it’s versatile, I still find myself making the same tried and true chicken dishes week after week. Some of the favorites include Balsamic BBQ Glazed Chicken, BBQ Ranch Chicken Quesadillas, and this super easy slow cooker Tex-Mex Chicken. Although we have our favorites, sometimes trying new recipes is just what we need to add a little excitement back into the weekly dinner rotation. This week I decided to change things up and try a recipe I’ve had sitting around for Pretzel Crusted Chicken. I’ll admit, I was a little skeptical. Pretzels, with chicken? My skepticism was for naught because after one bite, I was sold! Crispy, crunchy, with a hint of that salty pretzel flavor, it was delicious. I made a mild cheese sauce to go along with it, but you could use any dipping sauce you’d like. My hubby thought BBQ sauce would go well with this, but I could also see a simple honey mustard pairing perfectly. I served this chicken with some fresh steamed veggies, and these Smashed Potatoes with Cheese. It turned out to be a super yummy dinner! Because I’m only cooking for two most nights, we usually end-up with leftovers. Sometimes a chicken recipe such as this one that is supposed to stay crispy and crunchy, does not heat up well. To my surprise, this chicken heated up wonderfully! The next day I cut the chicken strips into slices and made a super tasty pretzel crusted chicken sandwich. While this recipe is not kid tested, I have a pretty darn good feeling it would be well-liked by the younger crowd. You could even cut the chicken into smaller chunks before you coat them in crushed pretzels so that it’s easier for them to eat. In a small shallow dish (I use cake pans), whisk two eggs together. In another small dish, spread out the crushed pretzels. *Note, if you have pretty thick chicken, I recommend pounding each piece so that they are thinner. If the chicken is too thick, it will not cook all the way through. Season each piece of chicken with a little salt, pepper, and garlic powder. Dip each chicken strip in the egg mixture, then dip in the crushed pretzels. Repeat until all chicken strips are coated. In a large, deep skillet, heat (medium-high) enough vegetable oil to cover the bottom of the pan. When the oil is nice and hot, add the chicken. You may need to cook in batches so that you don’t overcrowd the pan. Cook for 3-5 minutes on each side, or until the chicken is cooked through and the coating is crispy, crunchy, and browned. Remove the chicken from the pan and allow to rest for a few minutes before serving. In a small sauce pan, melt butter. When butter is melted, whisk in flour and allow to cook for a few minutes. Slowly, very slowly pour in the milk and continue to whisk. When the sauce has thickened up a bit and there are no clumps, add in any cheeses you’d like and continue to stir until the cheese has melted. Add in dijon mustard, then season to taste with salt and pepper (I only added pepper. I felt like the cheese added enough saltiness to the sauce). Serve each piece of chicken with a spoonful or two of cheese sauce. Enjoy!